A wildland firefighter assesses the fire line on the Substation Fire. Summer in Bend often means putting up with smoke from wildfires that burn in Oregon—and this year is no different. On July 22 at about noon, fire spotters reported a fire 8 miles south of Bend. The Bessie Butte fire quickly exploded to 50 acres before crews halted its movement with a dozer line around the fire, according to Central Oregon Fire Info. China Hat Road is still closed at Knott Road due to the fire, which fire officials said was about 10 percent contained as of Monday morning. The cause of the fire is under investigation. 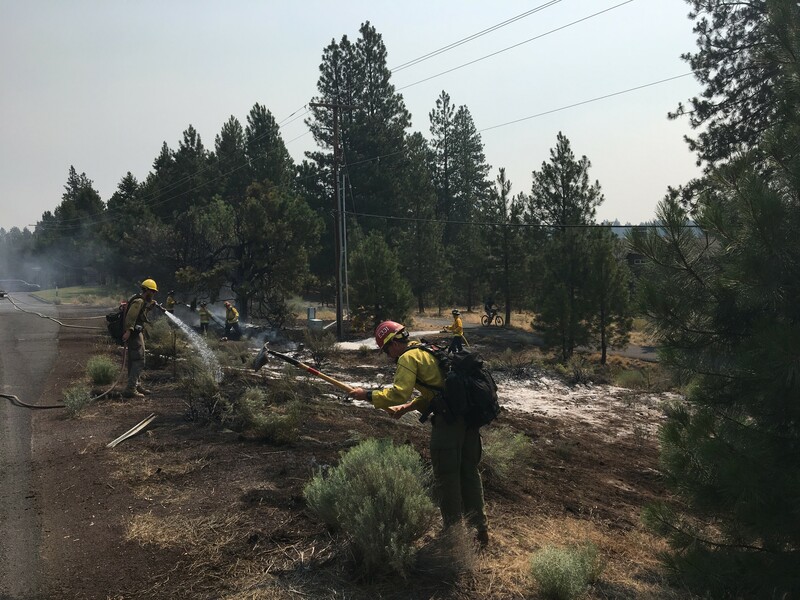 At about 10:30 this morning, a grass fire burned about 1/8 of an acre along Century Drive at Mammoth Drive, Dave Howe, City of Bend Fire Department said in a release. The fire was quickly put out, but the cause was undetermined, Howe said. 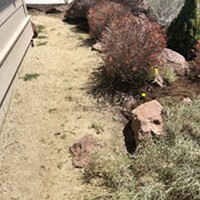 "The Bend Fire Department reminds you that we are in EXTREME Fire Danger conditions, and it is critically important to control and monitor all potential sources of ignition, such as cigarettes, sparks from grinding metal, chainsaws, vehicle catalytic converters, etc. 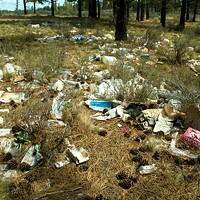 The grass and brush is exceptionally dry and receptive to ignition, so take extra care," Howe said in a press release. USFS crews mopping up small fire on Century Drive. 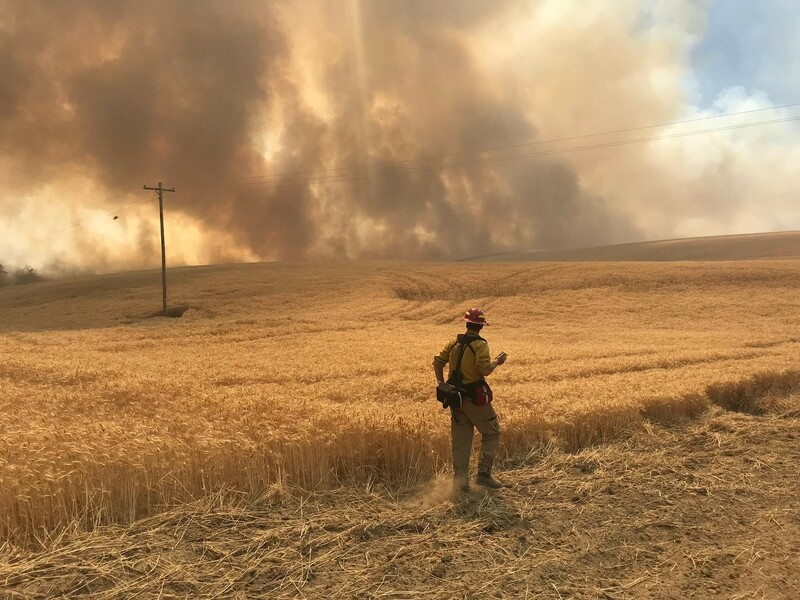 The 78,000-acre Substation Fire started July 17 on private land near the Dalles, but burned on both sides of the Deschutes River as it moved southeast. According to Central Oregon Fire Info, the fire destroyed four homes, damaged another four and threatened 1,188. One man lost his life trying to fight the fire. According to a story on KCBY, 64-year-old John Ruby was killed when he apparently tried to create a fire line with a tractor to protect his neighbor’s property. 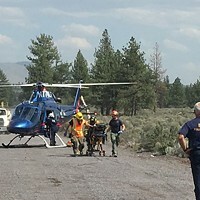 The fire is 92 percent contained as of July 23 and is under investigation by The Wasco County Sheriff’s Office, Oregon State Police, Oregon State Fire Marshal, the Bureau of Land Management and the United States Forest Service. The Cemetery Fire is burning 1,400 acres 32 miles east southeast of Prineville. The lightning-caused fire is 95 percent contained, according to COFI. It’s burning in mostly grass and timber and isn’t a threat to homes at this time. Fire officials expect to contain the blaze by July 31. There are many lightning-caused fires burning in Southern Oregon near Ashland and Grants Pass. One of the largest is the Garner Complex fire burning over 15,000 acres near Grants Pass. COFI says the fire is 14 percent contained, but expects full containment in August. *For people with heart or lung disease or respiratory illness, consider spending most of your day in air-conditioned buildings for relief from the smoke. *If visibility is 5 miles away but generally hazy, air quality is moderate and beginning to deteriorate. The air is still generally healthy except possibly for smoke-sensitive people. People should avoid prolonged exposure to the air in these conditions. *If under 5 miles, the air quality is unhealthy for young children, adults over 65, pregnant women and people with heart or lung disease and those with respiratory illness. *If under 3 miles, the air quality is unhealthy for everyone. The above mentioned group should minimize outdoor activity. *If under 1 mile, the air quality is unhealthy for everyone, and everyone should avoid all outdoor activities.